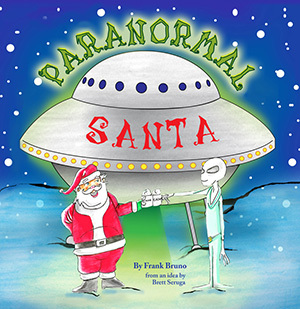 Liberty University Press recently released "Paranormal Santa" by Frank Bruno (idea by Brett Sergua). As a child, Brett Seruga enjoyed hearing fictional stories about mystical and unique folktales. His uncle, Frank Bruno, was inspired by Seruga’s favorite childhood myths to write and illustrate “Paranormal Santa,” a Christmas tale with a twist. "Paranormal Santa" is filled with the traditional elements of holiday stories, such as Santa Claus and his elves. However, it is also sprinkled with surprises of the paranormal variety - yetis, aliens, Bigfoot, and the Loch Ness Monster. Bruno takes his readers on a surprising journey to discover the origin of Santa's special powers. “We have all heard the story of how Santa Claus has acquired his magic powers, but until now, we haven’t heard the real story,” Bruno said. Santa shares little-known details about his magical life, including how he was raised by mythical creatures, throughout the pages of this wacky adventure. Frank Bruno resides with his family in Pennsylvania. He holds a Bachelor of Arts in Art Education from Moravian College and a Master of Arts in Psychology from Norwich University. In addition, he is working toward a Master of Arts in Counseling from Liberty University. Brett Seruga also resides in Pennsylvania and is currently studying Aviation and Engineering in college.